الأيتام لولا هذه الأسرة الكريمة بجوارها. 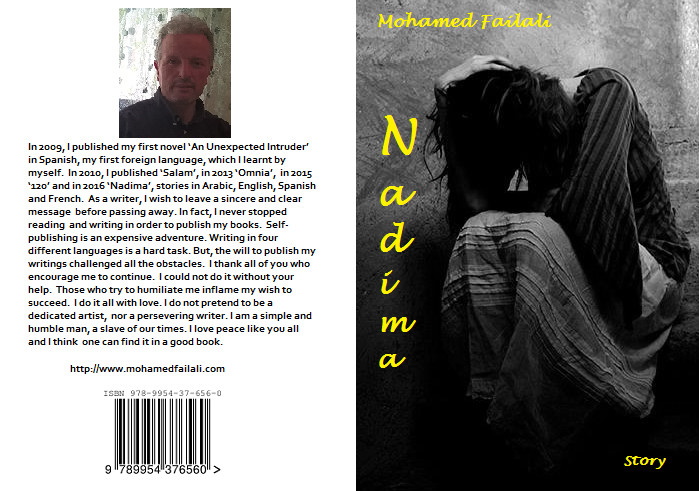 In 2009, I published my first novel ‘An Unexpected Intruder’ in Spanish, my first foreign language, which I learnt by myself. In 2010, I published ‘Salam’, in 2013 ‘Omnia’, in 2015 ‘120’ and in 2016 ‘Nadima’, stories in Arabic, English, Spanish and French. As a writer, I wish to leave a sincere and clear message before passing away. In fact, I never stopped reading and writing in order to publish my books. Self-publishing is an expensive adventure. Writing in four different languages is a hard task. But, the will to publish my writings challenged all the obstacles. I thank all of you who encourage me to continue. I could not do it without your help. Those who try to humiliate me inflame my wish to succeed. I do it all with love. I do not pretend to be a dedicated artist, nor a persevering writer. I am a simple and humble man, a slave of our times. I love peace like you all and I think one can find it in a good book.